How can I help my child live a heart-healthy life? Most children are born with healthy hearts. 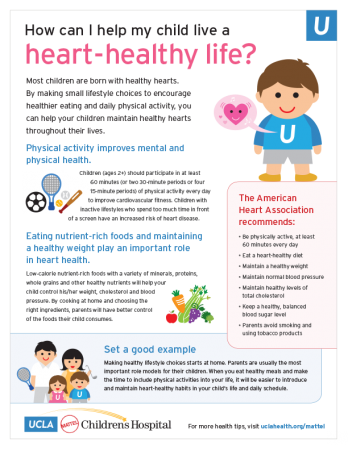 By making small lifestyle choices to encourage healthier eating and daily physical activity, you can help your children maintain healthy hearts throughout their lives. Physical activity improves mental and physical health. The American Heart Association recommends that children ages 2 years and older participate in at least 60 minutes (or at least two 30-minute periods or four 15-minute periods) of enjoyable, physical activity every day to improve cardiovascular fitness, physical wellness and emotional development. Inactive children who have sedentary lifestyles and who spend too much time in front of a screen (e.g., watching television, playing computer video games or talking or typing on their phones) have an increased risk of heart disease, high cholesterol, high blood pressure, obesity and diabetes. Too much screen time may also adversely affect your child’s musculoskeletal development, posture, neck alignment, eye function and overall self-esteem and confidence. Eating nutrient-rich foods and maintaining a healthy weight is an important part of heart health. Nutrient-rich foods with a variety of minerals, protein, whole grains and other healthy nutrients, but with fewer calories, will help your child control his/her weight, cholesterol and blood pressure. Your child’s diet should also contain no more than a limited amount of saturated fat, trans fat, sodium, red meat, sweets and sugar-sweetened beverages. 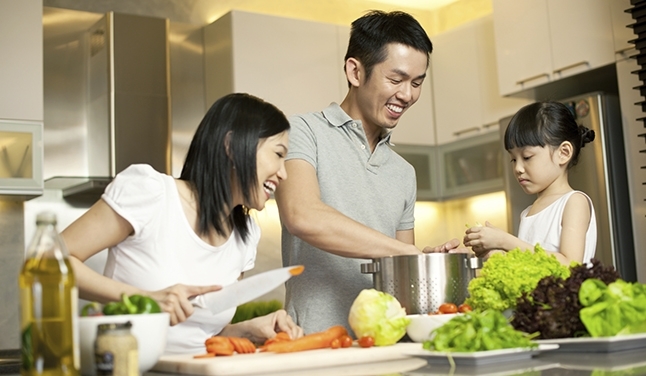 By cooking at home and choosing the right ingredients, parents will have better control of the foods their child consumes. 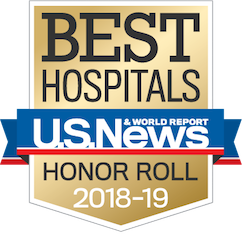 Learn more about the UCLA Children's Heart Center and visit our UCLA Spark page to support our Heart Month fundraising campaign.